#1 Cochran Buick GMC of Robinson has posted many photos from Ben’s appearance on November 14th to their dealership’s Facebook page! #1 Cochran Buick GM hosted a V.I.P. event on November 14th, 2011, for those customers who purchased a vehicle during the “Save Big, Meet Ben” event. Although Big Ben broke his thumb only a day before the event, he showed up in great spirits. He felt badly he couldn’t sign autographs due to his injury, but posed for photographs with all of the guests. Once his thumb is better, he has promised to personally sign all of the photos which #1 Cochran will then give to the guests to commemorate the event. In addition to meeting Big Ben, guests enjoyed refreshments and were entertained by 93.7 The Fan AND the Steelers’ own Steely McBeam. The event took place in #1 Cochran Buick GMC of Robinson’s brand new showroom. You can view all the photos on their Facebook page. Pittsburgh Steelers quarterback Ben Roethlisberger is doing his best to protect his fractured right thumb. Roethlisberger didn’t take a snap from center during practice on Monday, instead working out of the shotgun and pistol formations to avoid the risk of aggravating the injury. While he called the thumb painful Roethlisberger insists he should be good to go on Sunday night when the Steelers play at Kansas City. Roethlisberger hurt the thumb in the second half of a win at Cincinnati a couple weeks ago but stayed in the game. 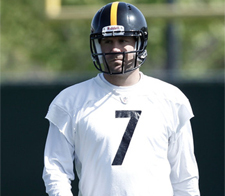 And Ed Bouchette’s interview transcript with Ben at the Pittsburgh Post-Gazette here. 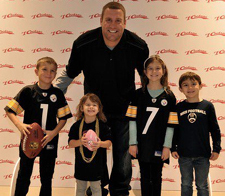 Easter, 2018: Things were really hoppin' at the Roethlisberger house last year! You can hear Ben's radio show LIVE every Tuesday at 11:00 a.m. during the football season on "The Cook and Joe Show " on Sportsradio 93.7 The Fan (KDKA-FM). He does NOT have a personal Twitter account nor a personal Facebook page. If you come across one, it's a fake! But you can follow his website's Twitter feed and Facebook page to stay updated! Now THIS is a sweet deal!! Place an order using the group code of 77-7777 on Sarris Candies’ website and Sarris will donate 25% of the purchase price to Ben’s foundation. Click on the image above for more info! Check out the Foundation page! If you would like to donate to Ben's Foundation, click here. Would you like BigBen7 to post a birthday wish for you or someone else? Just email me with the name, and the birth month and day! NOTE: Birthday greeting requests must be sent before the birthday month starts and prior to the posting of the new list. Otherwise, they will be put on the calendar for the next year. Stop by King Street Grille with locations in Charleston, Kiawah Island, James Island, Mt. Pleasant and Myrtle Beach! "Pittsburgh Steelers Quarterback Ben Roethlisberger is part owner of the Charleston-based chain that is decked out in full Steelers theme. However, King Street Grille doesn't play favorites, it's a sports bar where all sports fans and fanatics are welcomed. "If you're looking to catch up on sports highlights or catch a game, then this is the spot." -- Sun News Restaurant Review, July 29, 2010. The words from Coach Hep's favorite poem, "Don't Quit" were not recited just to motivate his players before a game - they were a way of life for him. Ben keeps a copy of that poem taped to his locker. You may succeed with another blow. Rest, if you must, but do not quit. How close he was to the golden crown. It's when things seem worst that you must not quit.